Crop irrigation is one of the largest ways humans perturb the climate. Including irrigation in model calculations will help bring model estimates closer to a complete representation of the climate. Enlarge Image. Results: With the simple act of watering a plant, humans alter the balance of moisture in soil and the climate. Atmospheric scientists at Pacific Northwest National Laboratory included irrigation in a climate model and found that it shifts the balance of water vapor and upward moving air. This impact, seen in dry years especially, affects the layer of air closest to Earth, which is most susceptible to heat exchange and evaporation from the Earth's surface. Their findings show that irrigation may play a role in forming shallow clouds, which alter the local climate. Including irrigation in climate models brings the models another step closer to observations. Why It Matters: In many parts of the world, irrigation is necessary to successfully grow crops used for food and other human and animal benefits. 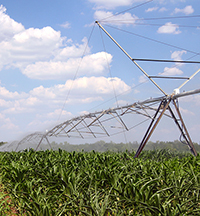 Though irrigation is one of the major human practices that alters the Earth, it is not often accounted for in current climate models or climate change projections. 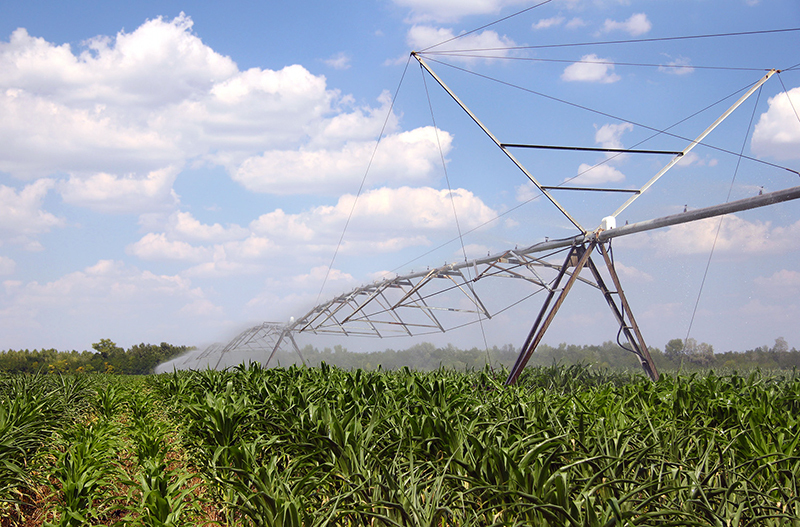 Exactly how irrigation may affect the climate system remains something of a mystery. To solve this mystery, scientists in this study investigated how irrigation affects climate through the exchange of heat or fluxes from between the land surface and the atmosphere, the formation of low-level clouds, and to what extent irrigation may modify future climate change. Methods: The PNNL research team led the study to incorporate an operational-like irrigation plan into the Weather Research and Forecasting (WRF) regional climate model. This included adding "sensors" and "triggers" in the model, similar to those employed by irrigation users, to detect the need and timing of irrigation for optimal water use. They evaluated the performance of the improved model in simulating the regional climate and surface water and energy budgets over the Atmospheric Radiation Measurement (ARM) Southern Great Plains (SGP) site. The team included a parameterization to represent irrigation in the Noah land surface model applied in WRF, and conducted a series of simulations with and without irrigation over the SGP for an extremely dry year (2006) and wet year (2007). A large amount of observational data was obtained from the ARM archive, including soil moisture and temperature, surface fluxes, and meteorological conditions. These data are from the ARM Eddy Correlation Flux Measurement system, the Energy Balance Bowen Ratio station, the Soil Water and Temperature System, the Surface Meteorological Observation Systems, and the Oklahoma Mesonet. After processing, these datasets served as benchmarks for model evaluation. What's Next? By applying a regional model over a limited domain for only two selected summers, the team was not able to investigate the possible downstream precipitation effect and the impact of irrigation on climatology. Future work will extend the time periods and increase the area studied to assess the impact of irrigation on regional climate and the water cycle. Their study will include the hydrologic responses such as runoff and streamflow over land and atmospheric processes above the boundary layer. They will also evaluate the impact of model resolution and model physics, identified as the biggest sources of uncertainty in the existing modeling studies on irrigation effects. Sponsor: The U.S. Department of Energy (DOE) Office of Science Biological and Environmental Research (BER) Atmospheric System Research program. DOE's Atmospheric Radiation Measurement (ARM) Climate Research Facility and Oklahoma Mesonet programs provided the ARM/CART and Oklahoma Mesonet meteorological, heat flux, and soil data. The Oklahoma Mesonet Program is supported by the State of Oklahoma. Research Team: Yun Qian, Maoyi Huang, and Larry Berg of PNNL; and Ben Yang of Nanjing University, China. Reference: Qian Y, M Huang, B Yang, and LK Berg. 2013. "A Modeling Study of Irrigation Effects on Surface Fluxes and Land-Air-Cloud Interactions in the Southern Great Plains." Journal of Hydrometeorology 14(3):700-721. DOI: 10.1175/JHM-D-12-0134.1.